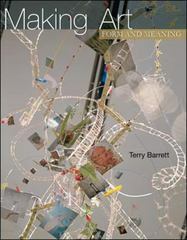 Making Art: Form and Meaning 1 Edition This comprehensive introduction to art and design explores making artifacts as a process of making meaning. Making Art: Form and Meaning offers a framework for understanding how all the aspects of an artwork--subject matter, medium, form, process, and contexts--interact. The text's wide array of examples and its emphasis on late-modernism and postmodern art give students a thorough look at the expressive possibilities of traditional design elements and principles and contemporary practices, including the use of computer-based, time-based, and lens-based media.With artist quotes, clearly defined key terms, and a chapter dedicated to studio critiques, Making Art allows students to join the conversation of contemporary art and gives them a jump start in thinking and talking about their work using the language and concepts of today's art world.